0 Comment February 24, 2017 Like? Today, we wanted to review the new iPad Control Surface app available for iOS. This app has been developed by Seth Haberman and is available for download for only $4.99! The control surface allows you do almost everything you can from a control standpoint in vMix from a remote location on an iOS device. The app features 12 buttons for overlays, preview control, and program switching. It also offers a 12 channel audio mixer which is super helpful and even easier to use in my opinion than the built-in vMix audio controller! So, first of all let’s talk about connecting cameras to vMix for PTZ camera control. This can be done via IP connection or UVC connection. To find the IP address of your camera all you have to do is search for it on your network. 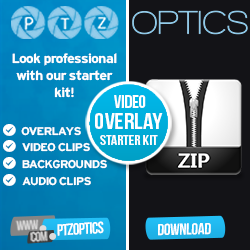 One you have the Static IP address for your PTZOptics camera you can enter it into vMix with the video input. For this tutorial we will show UVC camera control since that is easier to setup and newer. UVC control works over a single USB connection to your camera. From here all you need to do is select UVC and press connect. Once you have connected we can start creating virtual vMix inputs that are assigned to camera presets. OK, so we have our camera presets which are assigned to vMix video inputs. Now we can use the iPad to move the PTZ camera around with vMix. The best way to do this would be to use the preview window so that the viewers watching the live video or “output” video are not watching the camera movements. Once the camera has moved to the needed position in the preview window you can use a transition to move to that camera preset live. We also review using overlays, previews and cuts in this video. Enjoy! I wanted to show you guys the brand new iPad controller for vMix available on the app store and I also wanted to show you camera control with the iPad so let’s go ahead and take a look here, let me zoom you guys in, so here I have an iPad with the brand new vMix control surface app and on this side I have just vMix running in a window here. I’m going to go ahead and remove this lower third here just by touching the button. So let me first show you the iPad kind of in more detail and then what we’ll do is we’ll actually use a camera control for this to actually control a camera. This is such a cool iPad interface I’m so happy with the way it came out because I didn’t design it or anything, but super cool. You can stream, record and do full screen in external. This is such a cool iPad interface I’m so happy with the way it came out because I didn’t design it or anything, but super cool. You can stream, record and do full screen in external and I’m going to move over here so that we can get a nice close up of this with our really nice cannon camera, because I think there might be a little glare. You can literally with the touch of a button click stream to start live streaming, hit record, you can go full screen and you can do external so if you are a vMix user you know those are like the four cooler functions there and I always forget to start recording during my live shows I always just stream, so this is great. Another great thing about this by the way is giving you the ability to have multiple people working on the same video production so in our live stream I have Tess helping me from time to time and now she can have her own iPad controller to just to a couple extra things here and there as needed, when needed for example. Another great thing about this by the way is giving you the ability to have multiple people working on the same video production so in our live stream I have Tess helping me from time to time and now she can have her own iPad controller to just to a couple extra things here and there as needed, when needed for example. So this are the overlay functions and really quickly I’m going to actually just use this fader here to show you fading between two presets. What I have in my preview and what I have in my output I can just fade between those. Now, really quickly, one of the things I’m going to overlay on top of this video and show you is that we can do IP camera control, but what’s brand new in vMix is called UVC camera control which is actually camera control directly over a USB connection. PTZOptics support this types of camera control and we’re going to use that to control a camera that I have in this room and then set-up multiple vMix preset with the click of a button, I can control the camera and actually not have to worry about any other camera control otherwise. PTZOptics support this types of camera control and we’re going to use that to control a camera that I have in this room and then set-up multiple vMix preset with the click of a button, I can control the camera and actually not have to worry about any other camera control otherwise. So let me actually go to this preset here, one of the things I have here is have a main cam, I’ve got cam 2 and then I have PTZ 1, 2 and 3 and these are actually …these inputs here are actually presets on the camera so when I go over here and use my touch screen …now of course you don’t need this iPad touch screen to use that functionality inside vMix, vMix even have a web browser input that makes it free and easy from any touch pad but this iPad I’m not quite done with this, this is really, really powerful system. First of all let’s just keep digging into this, we have the overlay channels here so the way that works is you can see that each input has a name and in other to really use this properly you really should name every single input with a short maybe 8 character name because if you get to many character it just shows a dot, dot, dot. What you can do is you have 4 channels of overlay, so you have channel 1, channel 2, channel 3 and channel 4 and you can choose the channel that you want so for example if I want to come up on channel 3 I choose channel 3 and then again I’ll just over lay that number 6 which is my title. Just by clicking that I’ve overlayed it on let me just double check to make sure we are right here. Channel 3, it’s a little small, don’t know if you guys can see that or not, but channel 3 there, I’ll just go ahead and undo it with the click of a button. Channel 3 there just have the overlay. What you can do is you have 4 channels of overlay, so you have channel 1, channel 2, channel 3 and channel 4 and you can choose the channel that you want so for example if I want to come up on channel 3 I choose channel 3 and then again I’ll just over lay that number 6 which is my title. Just by clicking that I’ve overlayed it on let me just double check to make sure we are right here. Channel 3, it’s a little small, don’t know if you guys can see that or not, but channel 3 there, I’ll just go ahead and undo it with the click of a button. Channel 3 there just have the overlay so it’s really, really powerful stuff. So now let’s look at the camera control …let’s finish the iPad. So this is quick hot-swapping to program so for example I have cam-2 very quickly I’m going to switch to cam 2. Boom cam 2. Now I’ll go back to cam 1 that’s program hot switching. What we can also do is actually move the camera to preview mode and now we actually control the PTZ of the camera. So for example, I have a preset on the screen here which is pretty nice so what I’m going to do is I’m going to actually go ahead and use the T-bar to switch between this two, see that, so the best way one of the absolute best way to use camera control, we get this question a lot, if you have multiple camera’s is not to be panning and tilting and calling preset on your main camera,, your main camera should usually be a static camera or the ability to slowly pan until the zoom is okay but you want to do most of your panning and titling with your secondary camera off screen. So in preview which I’m doing here and you can see I can have change the PTZ with the click of a button in preview mode and then I can go ahead and fade to it so again I’ll just go ahead and put it up to that PTZ pillow there and I’ll use my fade to black to fade too camera two, so that’s really the professional way to use multiple cameras. That’s kind of a no-brainer, a lot of people know that. So we’ve looked at this ….very, very simple video production key elements, the things that you need. The stream button, the recording button, the full screen button, we didn’t talk about the transitions here. vMix support multiple different transitions and in the center here we have the ability to select 4 different custom once and then we’ve got a quick plan to cut while the once that you select in this top 4 here so I have merge, fly, vertical wipe and a stinger those actually show up right on this iPad right here. So if I want to do a transition of a merge you can see that I just did merge just by hitting the iPad, if I want to do a fly-in that’s number 2 and then number 3 is a vertical wipe. So we can very easily do different transitions and you can customize those in your main vMix, this is just your control surface you can’t change does you just change does in the vMix settings so again we’ve got overlays, you can control what channel of overlay you’re using, you’ve got your quick program selects, you got your preview and my favorite is a volume audio mixer controller. I don’t even know if I mentioned that this app is only $5 by the way on the app store. To me the control surface is incredibly powerful, look at that, imagine if you’ve got 6 array volume input we have this problem all the time where somebodies audio is a little too high or a little too low, happens all the time and this is literally a better looking audio mixer than the one in vMix, so it’s a really, really great system you can see here you got A and B bus control, it looks like 1, 2, 3, 4, 5, 6, 7, 8, 9, 10,11, 12 different audio levels that you can be looking at, at the same time and that’s really the majority of it. The only thing I didn’t mention is in the settings tab one of the things you’re going to have to do and if you can is to connect the control surface to. To connect to the vMix control surface you need to go into your vMix settings and you have to go to web controller and get the IP address of your vMix section so you can see here that in the IP address of the iPad I’ve entered the vMix web controller IP address, that’s really important once you’ve done that you’ll see a little check mark and you’ll be connected and it will now pull in all of the information from vMix available on a touch screen iPad, I mean it really doesn’t get much easier than that. It doesn’t have to be an iPad if you just want to use the IP address in any web browser or any computer which Is really nice but this iPad interface really makes it nice I’m a big iOS guy, I love iPad’s so this is an awesome app, I love the fader, I love the touch capability, great job, we’ll put a link below on how to get this $5 app for the iPad and thank you for taking the time to watch this video, I got some vMixing to do!